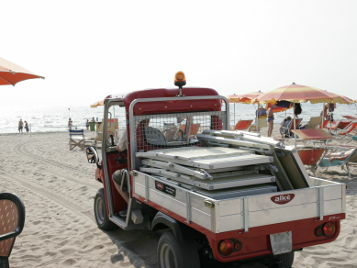 Can I use an electric vehicle even in beaches? 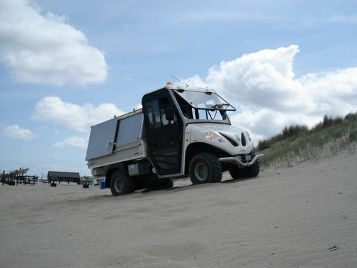 Alke vehicles maintain high performance even on the sand. 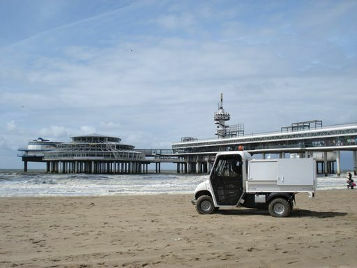 If you are looking for an electric vehicle that is able to move without problems on the beach Alke electric vehicles are the solution for you. The performance of Alke electric vehicles for beach are very high, certainly greater than a golf car, mainly due to the high power AC motor, the special structure that allows it to move easily on the sand without slowing down and the tires for specific use on sand. Thanks to these characteristics Alke vehicles are able to maintain the same operation also on land considered at risk just as the sand. 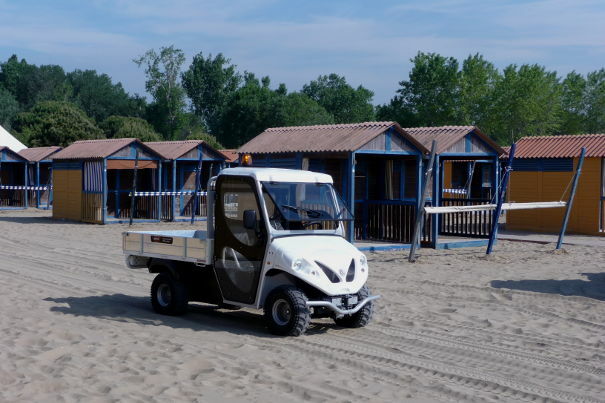 Our electric vehicles can be used on the beach and in camping and villages with access to the sea mainly to carry luggage, for the sun beds and umbrellas handling, but also for the various maintenance activities that these areas require. The recommended model to operate in these environments usually is the ATX230E, which according to requirements can be equipped with the most suitable configuration. 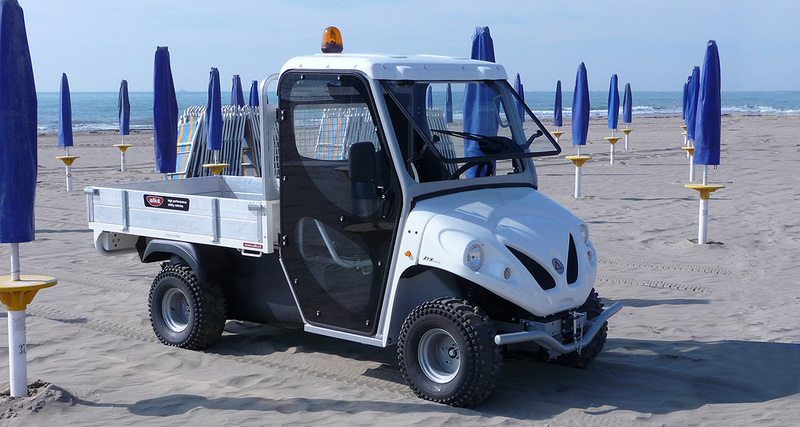 The ATX230E can easily be used for example to empty baskets and collect waste or, more generally, as a multipurpose vehicle for maintenance and supervision of beaches, camping and holiday villages. Thanks to the active PFC high frequency charger on board you can charge your own Alke' electric vehicle easily, without being tied to particular sockets or charging stations. Thanks to the versatility and efficiency of ATX230E you'll have one vehicle with zero emissions, which will allow you to perform several tasks simultaneously. You will be able, with the same vehicle, in fact, to collect garbage and get them to disposal, moving sun beds, umbrellas, etc. 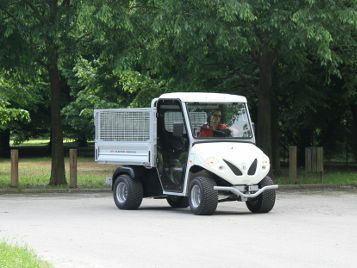 These vehicles are more versatile than a golf car, in fact, you can choose from a wide range of equipment, the majority also interchangeable in a few minutes. 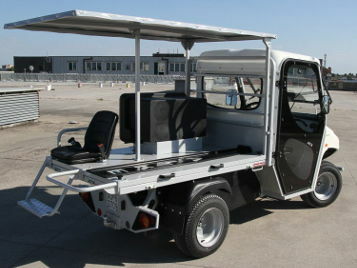 The cargo area with steel mesh sides is useful for example for maintenance or for the collection of waste, the people carrier module to transport guests within the establishment or village/camping, the first aid module to have a real ambulance vehicle for the first intervention at the beach. Among the configurations it is also available ice cream module (version 6 or 12 flavors) for the sale of ice cream and soft drinks along the beach or inside of tourists villages and camps. 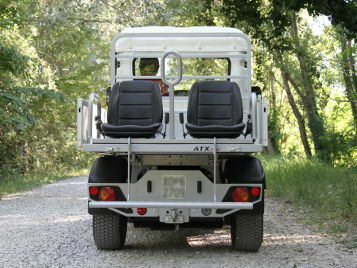 For more comfort in the cab, the Alkè vehicles can also be equipped with air conditioning.